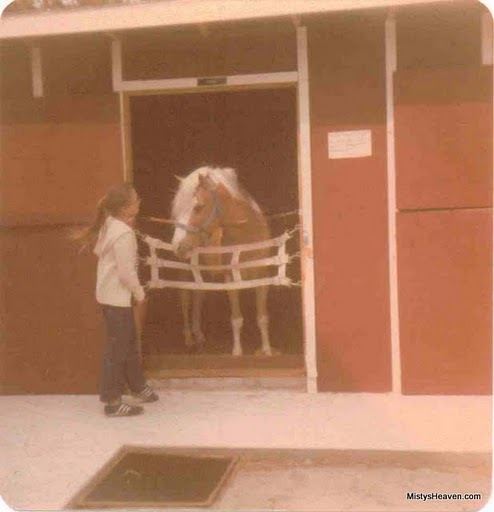 Thunder was Stormy's first foal, a palomino pinto who bared resemblance to his uncle, Phantom Wings. He was born at Beebe Ranch and lived there for the first few years of his life. When Ralph Beebe died of a heart attack in 1972, Thunder and his family members were moved to Paul Merritt's Chincoteague Miniature Pony Farm. Thunder was written about and listed on the family tree in the Pictorial Life Story of Misty by Marguerite Henry. He was also pictured in Wild Ponies of Chincoteague by Joseph Spies. Thunder remained a stallion all of his life. In the mid 1980's, he and Cyclone were alternatively turned out with the Misty family mares in hopes of breeding with them. Thunder has sired some Misty ponies but it is unclear on which ones they are. Stormcloud, out of Beebe Breeze, is most likely one of his get. Thunder was a passive pony in his stall, but people were warned not to go out into the field with him. In 1986 Thunder became blind from a disease known as moon blindness. He was kept in a paddock by himself during the day and in his stall at night to prevent him from hurting himself. However, one night, he managed to escape his stall and tried to join the Misty herd in the field. Cyclone, who was with the mares, had the natural herd instinct to defend his mares. The stallions ended up battling each other severely enough that they broke through the fence and ended up quite a ways from the Pony Farm. Thunder was injured in the fight and was put down to prevent him from suffering.